Renate Stoever was born in the German city of Plauen before the start of the Second World War. Enduring the daily hardships of the War, Renate and her family escaped to the West from Communist East Germany in 1947. Within a week of her arrival in the United States, she started to work in a small shop sewing beads on moccasins. A year later, she became a professional designer for Stein Tobler, the largest lace and embroidery firm in the United States at the time. She also designed for Van Raalte, Dior, Vanity Fair, Barbizon, Warner, Sears, J.C. Penny, Field Crest, etc. After stepping aside from the embroidery industry to start a family, Renate took up painting in oil, water color, and acrylics. Eventually, she entered one of her paintings in a competition with the New Jersey State Federation of Women's Clubs, winning first prize in the 9th District and first prize in the State of New Jersey. Renate Stoever creates paintings from things seen with the inner eye. This allows others to see what her mind sees: images on canvas that are alive with movement and spirit! Painting flowers has become Renate's specialty after many years of working as a designer. After winning a writing competition in the New Yorker Staats Zeitung, a German-American weekly newspaper, friends encouraged Renate Stoever to spend more time writing. Taking their advice, she published a memoir called Escape From Plauen, a true story about the ravages of war seen through the eyes of a 9-year-old girl in Plauen, Germany. 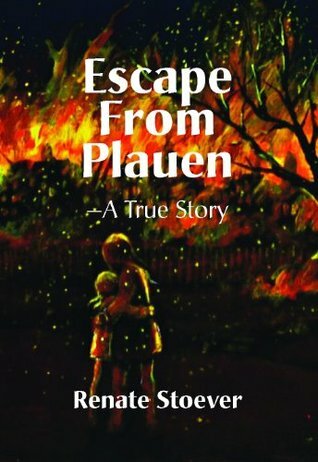 Escape from Plauen is a first-hand account of life in the German city of Plauen before Hitler’s defeat at Stalingrad that marked the beginning of the end for Nazi Germany, through the destruction caused by the wrath of the Soviet Army. Caught between Stalin’s advancing Communist Army in the East and the Allies march from the West, the women, children, and elderly of Germany had no place to hide long after the collapse of the Wehrmacht. What was there to bomb in late 1944 and 1945 but women and children? An artist as well as a writer, Renate Stoever has an artist's sensibility that lends beauty to her writing. As a result, the reader is not just an observer, but also a participant in her experience.This memoir of a remarkable life is a polished gem. It will keep you turning pages until the last word." —Christine Royer, retired Vice-President of Public Affairs, Barnard College, N.Y.